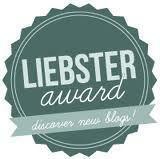 A great big thank you goes out this morning to Carrie Slager over at The Mad Reviewer who nominated me for the Liebster Award! YAY That’s my second award ever and I’ve only been here just over a month. *thumbs up* That being said, this award comes with some rules I have to follow, so here goes nothing. Though few people know this, I am legally Native American enough to live on a reservation – though I don’t live on one, and don’t have any plans to. I’m Chiracahua Apache. I am the youngest of six children in my family, and an identical twin. I am an artist on DeviantART by the name of DarlingMionette. I also do game-play commentary on YouTube by the same name. I am 29 years old, but most people who meet me / hear my voice assume I’m 19. People who call my house for things often ask if they can speak to my mom. At this point however, it doesn’t really bother me. If they want to think I’m still 19, I’m not going to argue! I am allergic to chocolate. Yes, it’s a horrible allergy. I actually like chocolate.. it just makes me really sick. I still eat it sometimes, even though I know I’m going to regret it later. I sometimes think of myself as an evil genius. Outwardly I’m very nice and pleasant and optimisitc… but on the inside I’m manipulative and evil and thinking up the best ways to get everyone to do exactly what I want. Just kidding. Or am I? MUAHAHAHAHA. My favorite color is blue, my favorite animal is a giraffe, my favorite “monster” is the zombie. I sometimes act “blonde” around my friends and family so that no one will expect much from me. It also makes it easier to be an evil genius. I don’t drive. I have a car, I have a driving license but I hate driving. It makes me nervous, so I refuse. I walk everywhere I can. I may be the only 29 year old woman in America that doesn’t own a cell phone. I’ve never owned one. I have no plan to own one. This does make things difficult however when so many websites requires a cell phone number for security activation. WTF internet. Stop it! What made you start blogging? My OCD and obsessed need to hear myself talk. Seriously. I was spending so much time reading and thought it was a shame that I didn’t have anywhere to post my opinion on the books I was going through – because.. I don’t know. I feel the need to share my opinion sometimes. Haha. Anyways, I’m not really cut out for book clubs because sometimes I don’t want to read what they tell me to read, so the next best thing was a blog, where I could monologue as much as I wanted to about the books I love, and I don’t really have to worry about taking stage-time away from anyone else. Skittles: Do you eat the read ones last? : Nope. Actually I eat the green ones last and the red ones first. Why? Because I rather get the ones I don’t like out of the way and end on something I love. It leaves a better impression. What do you love the most about blogging and why? This is going to sound rather too deep for such a simple question, but I love that blogging creates this avenue where people can just be people. It can be almost a diary… a slice of someone’s life that they’re willing to show the world, and I think sometimes it can give you a much better understanding of who a person is than if you just met them in person. Blogging creates this “bubble” where the blogger is creating a personal monologue with the universe, and the readers get to peek inside. It’s intimate and honest. If you had to pick one book to define your childhood, what would it be and why? I want to say Bridge to Terabithia by Katherine Paterson. I loved that book when I was younger (still do). It’s all about adventure, imagination, and tragedy, and I think that pretty much sums up my childhood. Coca-Cola or Pepsi: I honestly don’t know if I could decide. When I was younger I only drank Pepsi, and then as I got older, I only drank Coca-Cola, now I like them both … so.. eh. I don’t know *flail*. What’s your favorite song, and why? : Falling Apart by Lisa Loeb. I know, it’s out there and most of you probably haven’t heard of it. Why do I like it? Because it reminds me of when I was a teenager – and it’s something I try not to forget. The song is basically about a girl who is falling apart in front of everyone she knows, but instead of helping her, her family just watches her and pretends they don’t see it. When I was younger, I was abused and unhappy, and by the time I was 16 I was falling apart quite literally. At that point in my life it felt like I was screaming for help, but no one heard me. Finally, I attempted suicide. I lived, and people started to pay attention. I got the help I needed, and I learned some very important life lessons about not only myself, but my family, and life in general. I came away from the experience stronger, and now that I’m an adult, I’m a much happier person. The song embodies that period of time in my life when things were at their worst, but it also embodies the time when my entire life changed for the better. I don’t want to forget that. What’s your current favorite TV series? : Oh man. So. I haven’t had TV/Cable for the better part of the last few years. I just recently got cable back, so I’m not really sure yet what my favorite TV series is. I tend to watch a lot of National Geographic, History Channel, and Discovery. What do you think of blog awards? Like them or Loathe them? : It’s a mixed bag for me. I love getting awards (all two that I have) because it means that someone noticed I exist.. and that’s an awesome feeling. However, I’m not a big fan of how blog awards seem to be chain-letters in disguise. They’re never just “given” to someone, and you don’t really have to compete with anyone to get them.. they’re handed out like candy.. and you’re always expected to answer some questionnaire and tag other people. I’d appreciate them more if they were something I actually deserved rather than something someone made up in Photoshop and posted to hundreds of blogs all over the internet. Does bad grammar bother you? : For the most part, yes. If I see someone using bad grammar my immediate instinct is to try and fix it for them, but I do have the ability to hold my tongue, and most of the time I try not to be one of those annoying grammar nazi’s that comments on people’s grammar every time they say something. I have the ability to inwardly cringe while outwardly ignoring it. P.S. If you’ve already been nominated for the award, feel free to NOT re-answer all the questions. Instead, bask in your awesomeness and take an hour to relax. Those are literally like.. the only people I know. Okay, I know a few more, but these are the ones I follow who don’t have a counter sitting on their page saying they have over 200 followers. Seriously people… I have to rant about the fact that you can’t find out how many people follow a specific blog on wordpress. My counter says several hundred people follow me, but I only have 43 blog followers. Those counters are unreliable because they also count your facebook friends. How am I supposed to know who has less than 200 followers?!. So, if you find yourself mistakenly on this list, chalk it up to wordpress’ bad counting. Nominate other people. I don’t care how many, do one if that’s all you feel like. Most people did 11. I don’t know 11 people. See rant above. You must post 11 questions for those you nominate to answer. You must post 11 facts about yourself. Tell us a little about your blog… what do you blog about? Do you have a job other than blogging, and if so, what is it? Do you have any creative talents, and what are they? What is the name / author of a book you read recently that you really liked? What bandwagon have you jumped on that you are sometimes ashamed to admit? If you could live in any period of time, what would it be? If you could live in any fictional world, what would it be, and who do you think you would be? What would you rather be doing right now instead of answering these questions?